The goal of every vision correction practice is to help its patients see and experience life to the fullest. At the Gulf Coast Eye Care for cataract and LASIK surgery in Tampa Bay, Dr. Michael Manning and his practice wanted to display that in every facet of their online presence. By partnering with them to create a custom-made, fully optimized website, Rosemont Media’s team of designers, developers, and writers helped shape an educational resource for patients seeking information about eye surgery as well as a functional online identity that displays dedication and professionalism. Through detailed content and visually enticing graphics, the new site steers patients towards the information they need to help them make the best decision regarding their vision procedure, whether it be refractive lens exchange or cataract surgery in Tampa Bay. The Gulf Coast Eye Care website also features social media buttons and video integration for a seamless and engaging user experience that promotes enhanced doctor-patient communication. Thanks to a rich background in medical website design and development, Rosemont Media was able to craft the new Gulf Coast Eye Care website in a way that optimizes it for search engines such as Google, helping patients find exactly what they are looking for. Every facet is uniquely and intentionally targeted to address patient needs and reveal the experienced professionalism behind the Gulf Coast Eye Care’s team. 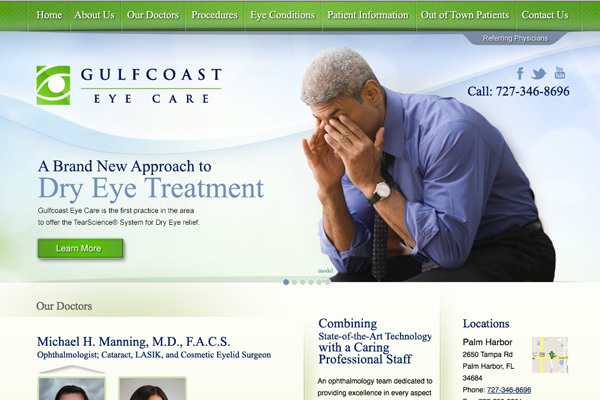 To get a better picture of the type of website our company can create for you and your practice, visit gulfcoasteyecare.com.